Shangri-la, a land of secluded valleys and peaceful villages, hidden by towering snow capped mountains, ruled by a wise king and untouched by the outside world for centuries. Hollywood has presented this fantasy to us many a time, but this fabled land really does exist outside the world of Hollywood, in the Kingdom of Bhutan. Bhutan will enchant you with its wondrous landscapes, it's friendly peoples, it's delightful culture unscarred by outside influences. It's a country where the king led his people towards a greater GNH (Gross National Happiness) not a GNP. Long isolated from the rest of the modern world by the Himalayas, the country preserves its traditions and values. Traditional dzongs (fortress like monasteries) dot the countryside, handing down centuries of Buddhist traditions. Thick primeval forests still cover much of the countryside, broken up by cascading rivers and small villages are surrounded by rice paddies and fruit orchards. Our ride through the Kingdom takes in all of this and more as we pedal part way across the country from the capital of Thimphu to Jakar in the central regions of Bhutan. Along the way we will explore the farming regions around Wangdue, the Black Mountains and a number of renowned dzongs. From Jakar we will shuttle back to Thimphu for the second leg, a exclusive loop ride south along the country's main river system, then into the Haa Valley, an area only recently opened to tourist. We'll tackle Chelela Pass from where we enjoy a 36 kms descent a fitting finale to the cycling leg. Our last day in Bhutan, we will enjoy a hike to visit the fabled Tigers Nest Monastery, with permits to visit the monastery itself rather than just going to a nearby overlook like most tours do. Join us for a unique cycling tour through Shangri-la . . . . the Kingdom of Bhutan. 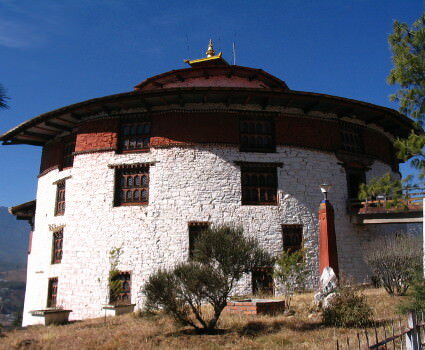 Arrive Paro, explore the National Museum, explore Thimphu. Your journey through the fabled kingdom starts with one of the world's most scenic flights, coming into the Paro Valley. After stepping off the plane into the cool mountain air, we will enjoy lunch and then a short drive to Thimphu (60kms/2 hours). Time permitting we will visit the National Museum of Bhutan. You will have time to admire the museum's collection of rare Bhutanese artifacts and art, traditional weaving and other eclectic pieces. This afternoon we will prepare the bikes and enjoy a brief sightseeing pedal around the city. Wind down your first day in Bhutan with our welcome dinner and orientation. 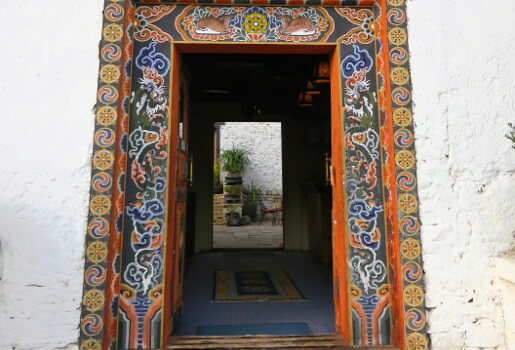 Bike to the 108 Chortens atop Dochula Pass, discover the risque house art in Wangdue. After breakfast you will tackle the 14 mile climb to Dochula Pass. The views from the pass are magnificent, offering a panorama of the eastern Himalayas. Enjoy lunch at the pass before starting the 26 mile descent from the pass to Wangdue through the leafy temperate forests and semi-tropical zone with abundant orange trees, bananas and bamboos. Evening you will visit a local farmhouse located about 10 minutes from your hotel, offering you a closer look at the Kingdom's unique culture, which dictates simple hospitality extended to any and all guests, even to perfect strangers. Our hotel is in Punakha tonight. 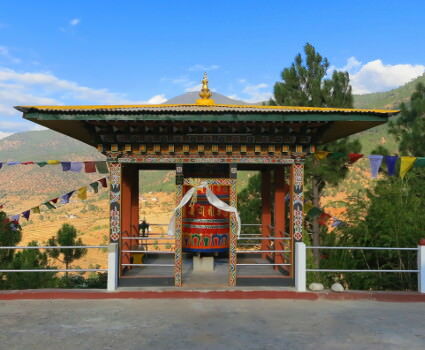 Cycle into the Black Mountains, overnight in Phobjikha Valley, explore the Gangtey Monastery. Today's ride starts out level, but a few miles up the road after we cross the Tikke-Zam (river), we begin the long ascent to the summit of the Black Mountains. Today's climb is our first really big climb, gaining over 4800 feet over 25 miles. Lunch will be served on route depending on the time. After lunch more climbing up to small pass marked by a stupa and finally some downhill to finish the day. We will be enjoying the beautiful Phobjikha Valley, this evening, exploring the monastery of Gangtey and the village. Perhaps we will spot some Black Neck Cranes, which migrate here to escape Tibet's harsh winters. Tackle Pelela Pass, enjoy views of Mt. Jhomolhari, explore Trongsa Dzong and Chendebji Choten. A short 1000 feet of ascent takes us back to the small pass we crossed yesterday afternoon. From the pass it's downhill to the main road from where you will continue your climb for 9 miles to Pelela Pass, the traditional boundary between the Western and Central Bhutan. Today's ride is a pleasant change from yesterday. On clear days you can enjoy the views of the Mt. Jhomolhari (7314m) rising in western Bhutan. It is a downhill almost all the way to Trongsa. Lunch will be served at Chendebji Chorten by the river side. After lunch the road contours around small ups and downs until you finally see the Trongsa Dzong. Evening you will visit the Trongsa Dzong and explore the Trongsa Town. 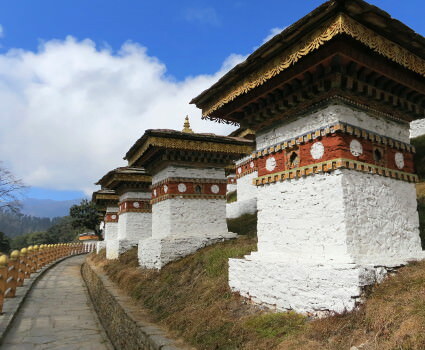 Bike over Yotongla Pass, learn about local handicrafts in Chumey Village, descend into Bumthang Valley, explore the Jakar Dzong (fortified temple). Approximately 18 miles after leaving Trongsa, you will reach Yotongla Pass. Then you descend to Chumey village where you will stop for tea and a visit to local handicraft shops where they make Yahthra a handwoven woolen fabric, the specialty of Bumthang valley. After a short gradual climb to Kikila (about 2 miles), a great descent to Bumthang valley.We will reach town in time for lunch, then set out to visit Jakar Dzong (the fortress of the white bird) and Jakar town. Visit 7th century Jambay Lhakhang, Shuttle back to Punakha. Day 7 is a leisurely ride to visit Punakha Dzong. Our day is pretty relaxed today. The morning is free to explore more of Jakar town or sleep in after several days of alpine pedaling. 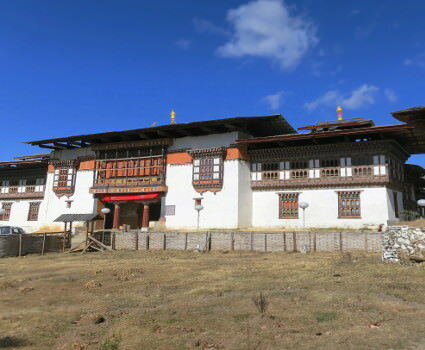 We will say good bye to Jakar with the visit to 7th century Jambay Lhakhang built by the Dharma King Songtsen Goenpo. It is said he built 108 temples in one day to pin down an ogress. One is Kyichu Lhakhang in Paro, Potala Palace in Tibet and others are said to be along the Himalayas. Around lunch time we will load up in our support vans and start the drive back towards Thimpu (unfortunately Bhutan has only one airport and no loop road, so we have to retrace our cycling by van). We will break up the drive with a stop in Punakha. We break out the bikes for a daytrip around Punakha town and the Wangdue Valley. This relatively flat ride will be a sharp contrast to our previous cycling. And offers opportunities to visit some of the famed temples and enjoy the quiet rural countryside. Today you will visit the Punakha Dzong built in 1637 by Zhabdrung Ngawang Namgyel, a Buddhist saint who unified Bhutan in the 17th century. 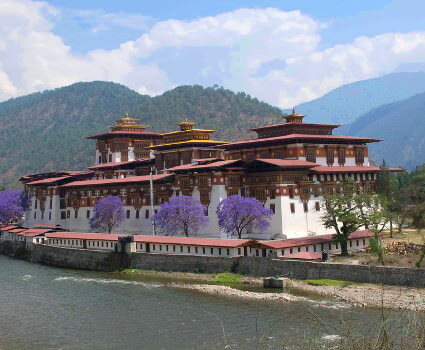 Punakha served as the capital of Bhutan until 1955 and it still is the winter residence of the Je-Khenpo (Chief Abbot) and the central monk body. We will again spend the night in Punakha. Hike to Chimi Lhakhang then transfer to Thimphu, Day 9 bike to Haa Valley, an area rarely visited by tourists. Another half day drive returns you to Thimphu, from where we started our first leg. After breakfast we will hike to Chimi Lhakhang dedicated to Lama Drukpa Kuenlay who is also known as "Devine Madman" in the west. This temple is also a worship place for woman for fertility. It is an easy hike through the rice paddies and the village of Yulakha. Resume your drive to Thimphu. In the afternoon, you have free time or for those wanting to pedal some more, we will organize a half day local ride to explore some more of the sights nearby town. We will relax tonight Thimphu. Back on the bikes today for a delightful ride downstream along the Thimphu Chu (river). When we reach the confluence with the Paro River, we will switch to a small road on the other side of the Thimphu River and start the ride into Haa Valley. This hidden valley was only recently opened to tourism and offers pristine landscapes and quiet village during a dramatic ride along the Wang Chu River. The road into Haa climbs slowly through quaint villages and thick conifer forests before opening into a valley dotted with fields of millet, barley, potatoes and wheat, where the farmhouses are adorned with intricately painted cornices and frames. Bike Bhutan's highest road, crossing Chelela Pass, enjoy 35 kilometer downhill run to Paro. One last climb today, as we cross over to the Paro Valley. On clear days you can enjoy the stunning view of Mt. Jhomolhari (7314m) and Taktshang Goenpa (Tiger's Nest). 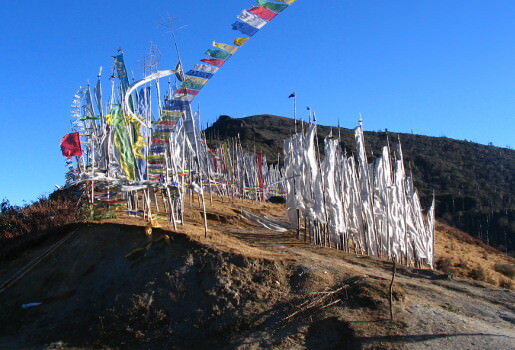 Its a 26 km ascent to Chelela Pass through pine forests and alpine scenery, rewarded by a 35 km descent to Paro town. Lunch at the hotel. Upon checking into our hotel, we'll set out to explore town a bit before dinner. 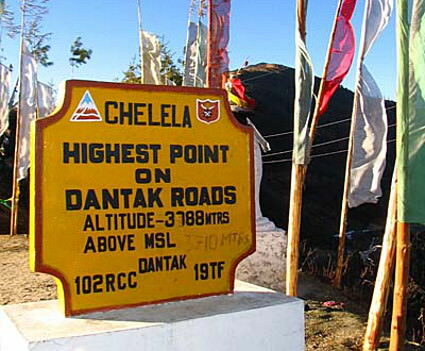 41 mi / 67 km, Pass: Chelela (3988 m). Hike to Taktshang Goemba (Tigers Nest Monastery), visit your guide's family's farm. This morning we will swap travel modes and enjoy a hike to visit the renowned Tigers Nest Monastery (Taktshang Goemba). We will have permits to actually visit the temple and will enjoy most of day here in the mountains, hiking and sightseeing. Upon our return to Paro, you will have a chance to finish your last minute shopping needs. We'll gather for a final Bhutanese dinner, swapping tales of the ride and country. We will shuttle everyone back to the airport for your flight to Bangkok. Elegant hotel in the heart of Thimphu combining traditional architecture with modern amenities. Cottages perched on the forested hillside overlooking the Pho Chu River. Ornate Bhutanese architecture, offering a panoramic view of the fields where the cranes roost each night. Hillside resort featuring colorful Bhutanese architecture and a birds eye via of Trongsa Dzong. A five star finale in a beautifully located combination of tradition and modern technology. Fill in the blanks and the tour details for Heart of Bhutan Bike Tour will be on their way.